Mainly search engine depends on some important item of your blog post. Unique post or topics Title means - write a post or topics name which is most unique and SEO friendly keyword basis. you can also use google keyword planner for choosing your post title keyword. then write your primary article name or post title and click get search idea. you can see the result. You choose or take keywords which are best search volume. when you write a new post or topics on blogger click HTML mode to write an SEO friendly post. you can use HTML code in HTML version. you must write your post or topics header by using H1 h2 h3 h4...html code. Because When search engine graph your site, it graph or find data in h1 h2 h3 ... tags. so must write header tagline by using h1, h2, h3, ... tags with the important post or topics related keywords. You write a new post which is must be unique and post words minimum 500 words. Your post or topics description must title related neither search engine avoid your website or blog page. Post description mainly cloud of important keywords. I also suggest to a new blogger to write their post about tips article as social, culture, health, information etc which post are will help to people. When you write a new topic or post you must use post related unique image or photos. Because a unique image or photo helps to your site to improve your search engine SEO result. You can use your post image by click to upload an image in the top menu. please see screenshot. after uploading your post related image then you need to set up image title, alt text. just click to composes mode and click on an image and set up image title and alt text. 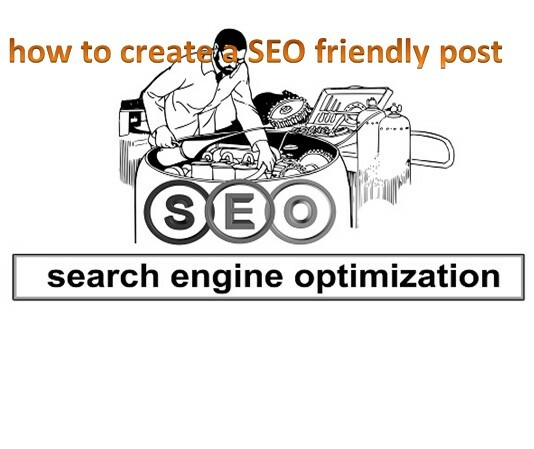 post setting is an important matter for SEO search engine optimization. you must Fill up this option. Write carefully your post label when writing it. Post label helps to your search engine optimization result and create your post category. Post label must write about your post related. If Your post is "How to create a free blog site on google blogger?" 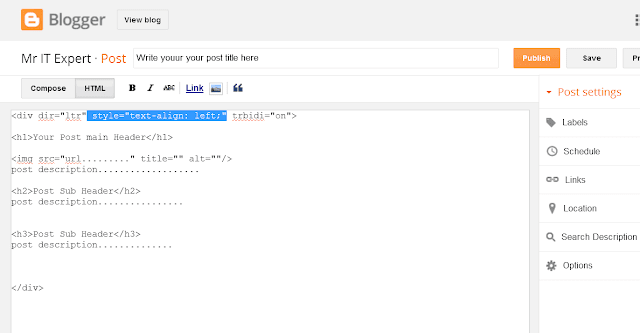 Write your post Label as "Weblog Tricks" if you need many labels, you will write many label name by using, comma. This is an important matter of SEO. So make a post URL or post link by clicking links. Carefully write post link if your post name "How to create a free blog site on google blogger?" will your post custom link as "how-to-create-a-free-blog-site-on-google-blogger" . Don't use _ underscore, Capital letter, complex or symbol character like # % $, Because this is not SEO friendly. This option is one of the most important of SEO process. here write important keywords which are related to your post and search volume well. Search on Google your Main Keyword and See Related Keywords or suggestion keywords of your keyword.